Last night we left our still damp carpet and went out in to the world in search of food and amusement. Friday night is Family Night, and we usually spend a large part of it debating what to do. Fortunately Maria made a decisive and clearly stated plan: "Pumpkin patch. I like a go pumpkin patch." Yes! We have a destination! A plan! Willing participants! Friday night turned out to be an awesome night to go to the neighborhood corner, where there were lights and straw bales and inflated jumpy houses. No crowds. No sulky-cranky pumpkin patch slaves. We owned. Alex and Max jumped to their hearts' content, which was a blast to watch. Maria bounced to her heart's content, which meant she did not bounce much at all. We even managed to get away with only purchasing one over priced squash orb. 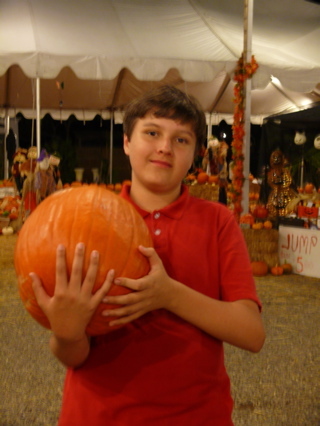 Alex has big plans for his pumpkin. Plans that include a Dremmel tool. We will share photos. 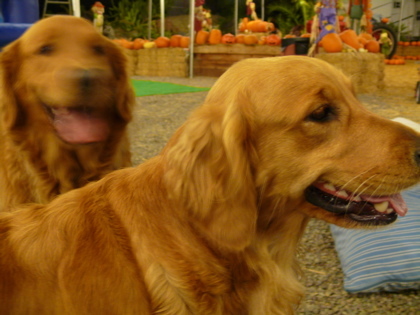 The pumpkin patch is home to two golden retrievers who were the kind of dogs that make me want to be a dog owner... they were that good! They never left the lot, they never barked or made inappropriate sniffing maneuvers, and they happily played with anyone willing to toss their dog toy. Awesome dogs. I took a lot more pictures, but my nighttime photo skills need some help. The flash is way too bright and the pictures taken with flash look... uh... look really, really, really bright. No flash can sometimes look arty, but most times just look blurred. More to learn. It's cool. Oh ya... the insomnia. Sometimes Geoff and I both have insomnia and we stay up talking and expounding on all of our brilliant theories. While I loathe insomnia, Synchronized Insomnia is kind of nice. We reconnect, solve problems, make plans, come up with designs, and philosophies and we cuddle. My brain was running a mile a minute with all kinds of deep thoughts and insights. I designed 3 major features of my dream house, I resolved to accept my thrift-shop domestic style, and I made a fantastic, if completely late, retort to the principal's take on 'parents and teenagers should not mingle at the school party' speech (bottom line: She's totally wrong.) Geoff summarized where all of these economic turns are taking us... the dollar plummets, China cuts their ties to the dollar, no more cheap imports, so Americans reboot their manufacturing and we become the exporters, which doesn't really help the environment, because it's still all about buying stuff. From 2 a.m. until around 4:45 a.m. we were geniuses, eloquent and articulate. Yes! Now I am off to save the world! And later, a nap, because I need sleep real bad. Pumpkin patch! Now that's a good idea. I'd better hit one tomorrow. Thanks for the reminder! 2. enough mess to last 'til Christmas... you basically grind and juice the pumpkin and the wet dust flies EVERYWHERE! Marisa, are you lagging? I am. We've hardly done a thing for Halloween and today my boys are relentlessly hounding me about costumes. Mercy.